The tyre is where the rubber meets the road and it needs to perform, whether it be in a race or travelling through harsh terrain in a cold New Zealand winter. I’ve written plenty about my recent 13-day cycling adventure across New Zealand. During the trip I road-tested the Schwalbe Pro One and G-One Speed tubeless road tyres on almost 2,400 kilometres of gritty, coarse and icy terrain in New Zealand’s Alpine territory. After 2,336 kilometres over 13 days of riding on Schwalbe tubeless road tyres, three words came to mind: speed, adaptability and confidence. This review will discuss my experiences with the Schwalbe products throughout my journey and maybe give the trusty and often neglected tyre a chance to prove itself in the world of bike components. The video below will give you a good overview of my experiences with the Schwalbe tyres – don’t miss it. Schwalbe Pro-One tubeless tyres ranked first when it came to rolling resistance. The next best tyre added roughly 10% rolling resistance to the bike. That’s a huge difference! When reducing tyre psi, the rolling resistance in the Schwalbe Pro One was only slightly affected when compared to the other tyres tested. These test results certainly aligned with the unexpected outcome I witnessed as I rolled out the door on my Specialized Roubaix in my last few days of training before travelling to New Zealand. The team at Schwalbe Australia were talking these tyres up, and with good reason too (as I would soon realise). As I stood on the factory floor watching the tyres get fitted to my Roubaix, I couldn’t help but be a little cynical… I mean, they’re only tyres, right? I have to be completely honest, I was a bit anxious watching the clincher tyres getting swapped out for tubeless. I had heard great things about the rolling resistance of tubeless tyres, but I had never ridden with them in my 10 years of road cycling. This also meant I had never fitted them or dealt with the sealant fluid inside the tyres. How would I handle a potential tyre issue on a cold and empty road in New Zealand? How easy would it be to get a tube in there if I decided to revert back to my safe-haven? 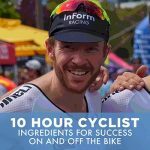 These questions ran through my head as I stood there watching Jesse from Schwalbe Australia fit the tubeless tyres with mastery; adding further distress given my mediocre hand skills. My anxiety about tubeless tyres appeared to be shared by others too, including professionals such as Martin Elmiger (Swiss champion of World Tour Team BMC Cycling), and Sylvain Chavanel. 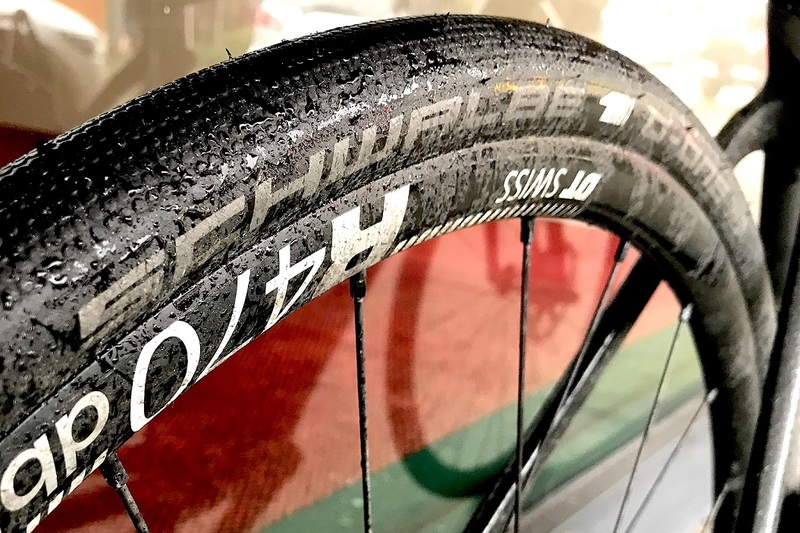 Reports suggested that they were also initially sceptical about these tyres, but after sporting the Schwalbe Pro-Ones on the harsh cobblestones of Paris-Roubaix, both riders were hugely enthusiastic about the tyres. They were amazed at the speed and comfort of the Pro-Ones, which guided them over the notorious lumps and bumps in the Hell of the North. Pro One is the all-round 25 mm tyre. The G-One Speed is designed for tougher terrain. I never rode the old Pro One tubeless, but Schwalbe claim the new patent MicroSkin construction has reduced the weight of this tyre by 25%, thus improving rolling resistance and speed. The MicroSkin construction has also bolstered puncture resistance through “vulcanising” high-tensile micro fabric to the rubber compound and carcass of the tyre. While this patent technology and recent test from Bike Rader clearly demonstrates the Schwalbe tubeless as a fast option, there are equally persuasive aspects to these tubeless tyres, such as adaptability. After riding the Pro Ones around Melbourne I was excited to take my new toy – tubeless tyres – on my journey across New Zealand. I asked myself, could I ride the length of the country, across gritty and volcanic terrain in extreme mid-winter conditions, without having to stop for any tyre attention? Schwalbe Australia also provided me with a set of G-One Speed tubeless tyres. Whilst I was still trying to fathom my massive journey across Middle Earth, the folks at Schwalbe brought me back to reality and recommended I change to the Schwalbe G-One tyres for the South Island. Given the alpine terrain with high levels of grit and icy roads, their recommendation proved to be a very wise one. To cut a long story short, I had a ton of rain on New Zealand’s North Island. If you’re not familiar with rain and rubber – the wet has an adhesive effect, making debris more likely to stick to tyres. In addition, the water acts as a lubricant for the debris, reducing the puncture resilience of any tyre. Between the start of my journey (Cape Reinga) and Lake Taupo, roughly two-thirds of the entire North Island, I had no rain free days, including two torrentially wet days (and some hail). That’s four and a half days of complete wet! Running the Pro-One’s on wet highways and rough country roads, I ended up experiencing a few flat tyres. The first one was captured by the sealant which was a relief as I was only 150 kilometres into a 200 kilometre day, on my very first day. However, in a fatigued state on arriving into my first destination I neglected to refill the rear tyre with sealant. A very silly mistake which resulted in another flat the very next day in the same rear tyre, this time though, there was no sealant there to capture the leak. I blamed myself for that one! At the time of this event I had been exposed to roads and situations that had left me feeling pretty vulnerable, and I was ready for any safe-havens I could find. So when I pulled over to the side of Highway 1, with logging trucks flying past at 100 kilometres per hour, I pulled out my tube, reconfigured the valve set up – taking only a few minutes – inserted the tube, and off I went. The wet roads had caused a large piece of broken glass to wedge deeply into the rubber. The sealant filled the gap, but I could see the glass still in the tyre. I pulled over to investigate further, levered out the glass with a twig and the tyre deflated. The sealant had been utilised to find the leak, but the wet roads had caused the glass to stick to the tyre so greatly that the sealant was unable to punch it out with the force of the compressed air! A bit unlucky, sure, but perhaps this is something to consider when riding tubeless tyres on harsh, wet roads. With ice and snow on the roads it was time for a Pro One G-One combo. 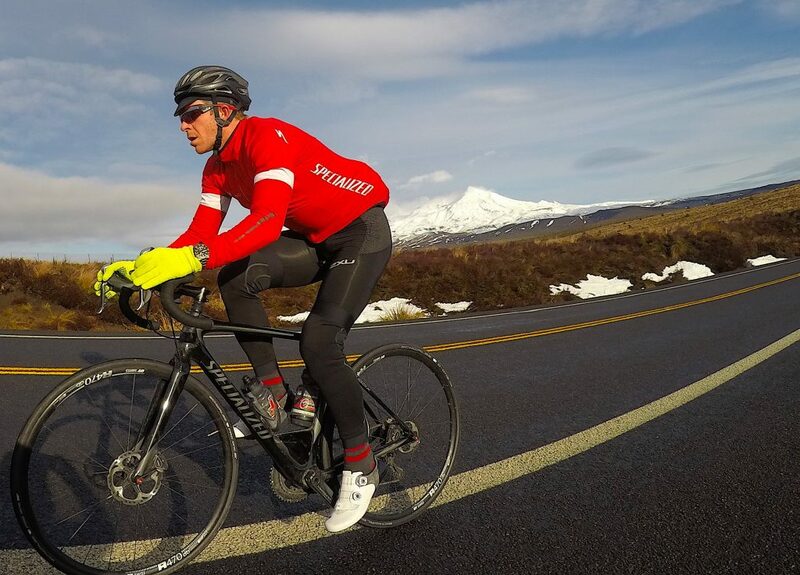 By the time I reached Taupo, with a couple of flats to add to the rear tyre’s name, I decided to leave the Pro One on the front to optimise rolling resistance over the big days in the saddle, and move to the G-One on the rear. In hindsight, the tube wasn’t required, but I added one into the mix for my own peace of mind. From Taupo to Bluff I rode 1,532 kilometres across gritty, icy, dirty and partially flooded roads and I didn’t need to stop once for any flat or tyre related issue. With a Pro One on the front and a G-One Speed on the rear, both with tubes, my rolling resistance appeared to still be in optimal shape. To give this context, my average speed went from 27.1 from Cape Reinga to Taupo, to 26.4 from Taupo to Bluff. While I didn’t have a power meter on my bike to benchmark speed vs. output, I am well-conditioned to ride between 230-240 watts on a continuous basis. So, it’s fairly safe to conclude that the G-One in the rear had minimal impact on rolling resistance. Furthermore, my average speed on a race bike, with 25 mm tubular tyres, hovered between 27.5 and 28.2 kilometres per hour when I was training in Melbourne on flat, smooth city roads. This offers additional compelling resistance cues for the Schwalbe tubeless tyres. Finally, and importantly, the Schwalbe tubeless tyres were adaptable. I had the benefit of elite rolling resistance combined with not having to pull over for a flat for the first few days in New Zealand. The sealant certainly does the job and will continue to do the job, assuming you refill the tyre following an incident, or don’t encounter glass or other sharp objects on saturated roads! However, if you decide to revert back to tubes using these tyres, you can. I did this with ease, and by all accounts, the rolling resistance stayed true. The only noticeable disadvantage of using a tube was running the tyres at a slightly higher pressure to avoid any negative impact on rolling resistance. This change had a small effect on the comfort of the tyres. If we put rolling resistance and adaptability to one side, I know the vast majority of cyclists just want to reduce their chances of punctures. My mid-winter journey across New Zealand, particularly the last 1,500 kilometres, is certainly a demonstration of the resilience of these Schwalbe tubeless tyres. But perhaps more profound is the sealant effect, because it just works really well. It is possible to put sealant in tubular tyres, but adding this – in addition to the tube itself – is a friction-inflicted tyre scenario most would want to avoid. On two occasions I heard the spurt of the sealant filling a sealed leak, once on my rear and once on my front wheel. When you’re cold and it’s raining hard, this sealing effect becomes a magnificent safety net. Given the blend of puncture resilience and the sealant effect (knowing that you could change to a tube, if you really wanted to), these tyres should fill any road cyclist confidence that their chances of stopping for tyre attention on their commute, weekend ride or race, are reduced significantly. I could never understand the fuss about electronic gears, until I tried them. The same applies to tubeless tyres, however, it is a slightly different scenario. Many people are still sceptical about them, and they’re certainly not as popular as electronic gears were before I made the change. Perhaps the early tubeless technology has tarnished the credibility a little, or maybe some brands aren’t doing them justice. Irrespective, Schwalbe have developed an impressive tubeless tyre range that is fast, adaptable and offers riders confidence. These tyres have changed my paradigm and I am certain the flow-on effect will come. Looking for new tyres and other cycling products? Find your new tyres for sale on Bike Chaser, from local retailers and private sellers. Love the g one speed been running them tubless for 6months will never look back from 44kph in a fast bunch to Cruzing gravel Rds. Such a versatile tyre. Hi Kim, thank you for reading the article and providing your own experiences. Glad to hear they align to what I personally encountered! Thanks for report on the tyres. Very informative. I do have a question on the rims but if I may. Where you riding DT Swiss R470 Disc rims which now come on the lower spec Elite? If yes can you clarify if these are tubeless ready? Information on them is scarce to say the least. 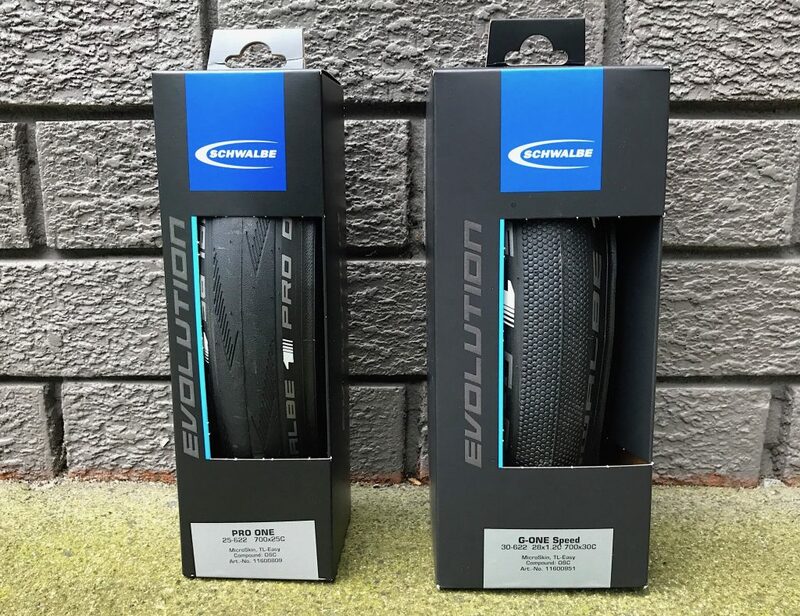 Great article… I’m looking to downsize my exposure 32c to a 30c or these schwalbe pro one… on my Kona roadhouse.. any comparison/guess on how these two would fair against each other?